In May 2006, the road transport and highways minister has launched the first draft of the proposed Voluntary Vehicle Fleet Modernization Programme (V-VMP) for betterment of vehicles. The programme proposes to offer tax benefits and discounts to people who buy old vehicles and replace them with new vehicles. Its most primary intention is to reduce the emissions and priority is to get old fuel-guzzling and polluting trucks off the roads. The Voluntary Vehicle Fleet Modernization Programme (V-VMP) is the programme on which the government is working on will focus initially on incentivising the buyers of new commercial vehicle and keep passenger vehicles out of its ambit. It will also cover two-wheeler vehicles in the first phase. As per the proposed policy, the vehicles bought prior to March 31, 2005 or those below BS IV emission standards would be eligible for incentives if those were scrapped and replaced by new ones. A fair value for the scrap on the excise duty at 50% of the normal rate on the new vehicle and special discounts from automobile manufacturers are on cards for those who participate. The incentives are expected to be reduced at the cost of a new vehicle for a buyer on an average 8-12%. The policy recommends complete excise exemption for inter and intra state transport buses to encourage public transport to shift to newer and higher capacity buses which will also help decongestant roads. 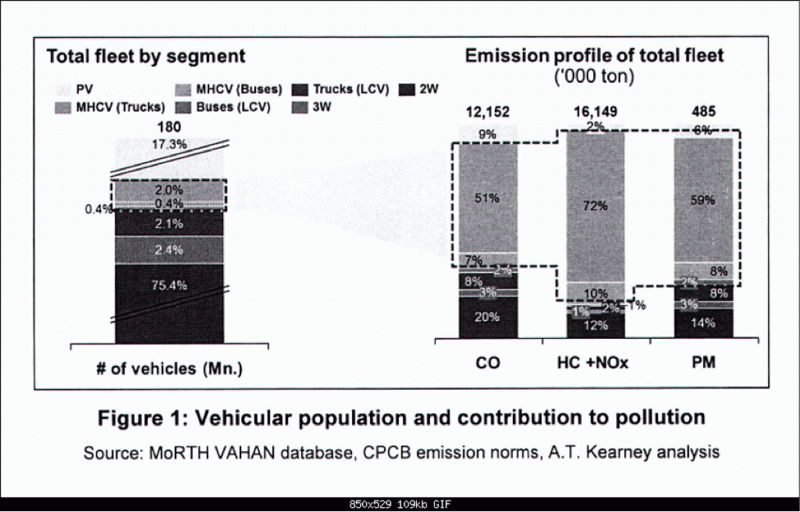 The Voluntary Vehicle Fleet Modernization Programme (V-VMP) is needed because of the analysis of segment and age of vehicles causing air pollution has shown that MHCVs (Medium & Heavy Commercial Vehicles) constitute just 2.5% of the total fleet but contribute to 60% of pollution. Besides, the older vehicles, typically more than 10 years of age and pre-BS I compliant, constitute 15% of the total fleet but pollute 10-12 times more than a new vehicle because of drastic change in pollution norms, thus, there is a urgent need for this scheme to take under action. The scheme will focus initially on incentivising buyers of new commercial vehicle and keep passenger vehicles out of its ambit and it will also cover two-wheeler vehicles in the first phase. Given that commercial vehicles change hands two to three times during their lifecycle, the government is also working out ways to issue tradeable certificates which would incentivise the last owner to scrap the truck and subsidise the purchase of the primary buyer which will create a win-win situation for all stakeholders and make the overall dynamics of commercial vehicle trade more vibrant. Under this plan, those opting for V-VMP will have to deposit documents relating to the vehicle at the recycling centre. After verification, the owner will get a VVMP certificate and the price for the scrap for which he has to provide the certificate to the dealer while buying the new vehicle to avail of the discount.